Bully, also known as Canis Canem Edit, is a third person action-adventure video game released by Rockstar Vancouver for the PlayStation 2. 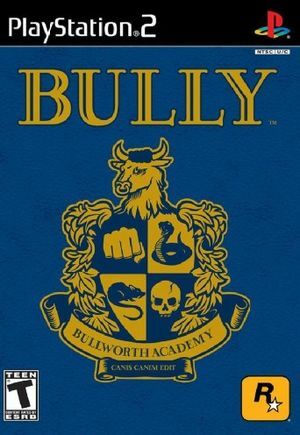 The game was released as Bully: Scholarship Edition for the Xbox 360, Wii and PC. 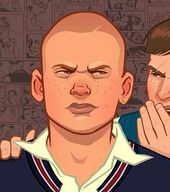 Bully: Scholarship Edition was released by Rockstar Vancouver, with Mad Doc Software (now known as Rockstar New England), involved with the development. The game uses an advanced Grand Theft Auto: San Andreas engine through Renderware. The game follows the story of fifteen year old troublemaker Jimmy Hopkins. Bullworth Academy, the main setting of Bully, appears briefly in an episode of I'm Rich in GTA IV, where it is shown as being one of fifteen "exclusive boarding schools" Jill Von Crastenburg was sent to. In the opening cutscene for the Shop class in Bully, a 3D Universe Stallion can be seen being repaired. The car has a similar paint job to the Diablo Stallion (but lacks the hood-mounted supercharger). Several cars that can be found around Bullworth are similar (but not identical) to vehicles from the 3D Universe, like the Washington, the Police Rancher, the Regina, the Yankee and the Boxville. The mission Vinewood Souvenirs - Tyler in Grand Theft Auto V has a secondary objective called Weed Killer, which is the name of a mission in Bully. The entrance of Bullworth Academy, as shown in I'm Rich. The Stallion seen in Bully. The vehicle in the background appears to be a Regina, but with a flat grille.